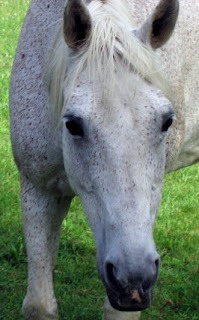 In an effort to celebrate the fact that horses are highly intuitive and sensitive creatures, I'll be offering reduced rate telepathic consultations with all equine species during the month of August, 2009. By providing insight into the hearts and minds of our equine partners, I hope to promote a universal understanding that every horse has an inherent dignity and is deserving of utmost kindness and respect. This month-long promotion, sponsored by Animal Translations, is open to all equine caretakers, and the telepathic sessions can explore virtually any topic, including information about a horse's life and circumstances, behavioral and training issues, compatibility with pasture mates, equipment changes, stabling arrangements, and even food preferences. Among the equine issues that I have routinely worked with are unexplained shifts in a horse's demeanor, acclimating a horse to a new environment, preparing for a move, prepurchase evaluations, and puzzling behavioral patterns that have not responded to modification by conventional training techniques. I believe that tuning into an animal telepathically can uncover jewels of information that can help to foster a more profound understanding between the species. This month, the focus is on horses, and I hope that any horse person who's ever wanted to contact an animal communicator will take advantage of this special opportunity. Normally priced at $65.00, equine sessions during August can be purchased through the "Consultations" section of the Animal Translations website for only $40.00. Clients can ask an unlimited number of questions, and will receive a typed transcript of the session, as well as an appointment for a followup phone call to discuss their concerns and questions.